Lucasfilm, Ltd. Pulls Greenpeace Ad From YouTube! As only the powerful machine that Lucafilm, Ltd. can do, they have pulled the Greenpeace spoof on the Volkswagon ad and all of its political overtones citing copyright infringement. Sorry if you missed it. It will likely show up on YouTube.com again somewhere else. Keep your eyes peeled! Jabba's Palace Archway Has Been Updated With Lights! Sideshow Collectibles proudly updates collectors with a new enhancement added to the Jabba's Palace Archway 12" Figure Environment. They have added a light-up feature. Click through for more! San Diego Comic Con Starts Tomorrow....At Sideshow Collectibles! Sideshow Collectibles has just announced that their online San Diego Comic Con begins tomorrow, July 1st. Stick close to JTA as we'll be posting their announcements as they make them known! Click HERE to bookmark their Comic Con page as well! A Spoonful Of Star Wars! DKE Toys is setting up an art show called “Spoonful of Star Wars” in their booth at San Diego Comic-Con next month! Click through for more information! She may not be one of the principal 52 Girls of the USA, but she is still "52" in her own little way, SAGA 052 that is! Lady Gragra may have a face only a mother could love, but her action figure interpretation is not too shabby at all! See why Research Droids Reviews is pretty fond of this ugly mug and discover why she is so essential to your basic figure collection! Please be sure to leave comments in our new Disqus comments section about this item! Click the banner below for the direct link to the review! Don't forget we accept requests so e-mail us. Hi - Here is a quick update from http://www.bigbadtoystore.com about some more new arrivals, cool new preorders, and our latest sale. Greenpeace has done an interesting "part II" to that infamous SuperBowl commercial this past year (that became a household favorite) entitled VW: The Dark Side! It's adorable and to be honest a little too political for our liking, but we think it's worth checking out! Click through to see "Muppet Babies" versions of some of your most favorite Star Wars characters in a very cute commercial! Operation Star Wars Style No Longer Just An April Fools' Joke! Our good friend and yours, Dan Curto from Rebelscum.com, came up with what may be one of the greatest April Fools' jokes of all time, a Darth Vader Operation board game. It seems as if his good idea is happening, but in a different light. Click through to read their report on what IS coming! Resurgence Of The Jedi Luke Skywalker At Your Fingertips! Many of you have written in and asked about the Resurgence Of The Jedi Luke Skywalker figure and if it would ever be available singly. We have great news to report. eBay seller tunghori has this figure loose for less than $7. Although it will be available again in the commemorative Blu-ray sets, the Resurgence Of The Jedi Battle Packs set has become extinct and it's been very hard to find any fossilized remains of it! Get it now! We finish up our focus on some of the coolest Battle Packs Hasbro has ever released with today's look at the Ambush On Ilum set, another TARGET exclusive. Research Droids Reviews likes this set a lot but admits that it isn't exactly perfect. But it's a nice tribute to Tartakovsky fans! Click through for more! Please be sure to leave comments in our new Disqus comments section about this item! Click the banner below for the direct link to the review! Don't forget we accept requests so e-mail us. 2011 SDCC Sideshow Collectible 12 Inch Clone Commander Processing! SDCC 2011 non-attendees should take note! Sideshow Collectibles will be processing your 12" Clone Commander on July 11, 2011! It looks like they're shipping the exclusives earlier this year! SW Fans Rule! Well, that's at least what the screen on the repulsorpod says. If you don't know what we're talking about, be sure to click right through and digest today's Research Droids Reviews because we go into detail about one of the the very few Easter eggs put into the toys we buy! Oh, and we didn't even mention that this was the set that brought us our first super-articulated Shock Trooper! How could we forget? Keep reading! Please leave comments in our new Disqus comments section about this item! Click the banner below for the direct link to the review! Don't forget we accept requests so e-mail us. You Will Not Believe This Score Folks! New Saga Legends For Cheap! JTA reader Bob Sokol writes in with another head-scratcher, although, this isn't the first time this has happened at Walmart! Click through for more! We look at another Battle Packs set today in our Research Droids Reviews archives. How well does the set hold up today? Please leave comments in our new Disqus comments section about this item! Click the banner below for the direct link to the review! Don't forget we accept requests so e-mail us. The Clone Wars Jar Jar Binks Hits eBay For Less Than $6! Wow! He is getting repacked down the road, but the impossible to find The Clone Wars Jar Jar Binks hits eBay for less than $6! Who knows if you'll ever get the chance again to pay this little for him! Click through to pick up this very elusive figure! Clone Trooper Kix Hits eBay! Kix from The Clone Wars Hunt For Grievous Battle Packs set (the 2011 version) has hit eBay! Click through to check out this awesome figure! Some lucky people are finding the brand new Captain Fordo in The Vintage Collection but for now get a good look at one of the best Tartakovsky inspired Battle Packs sets of all time, complete with the very first Captain Fordo we ever received (well, the first one actually called Captain Fordo we should clarify)! See why Research Droids Reviews still feels this set holds up well after a half a decade! Please leave comments in our new Disqus comments section about this item! Click the banner below for the direct link to the review! Don't forget we accept requests so e-mail us. TARGET Exclusive 3-Packs Next Wave Images Show Up! Hasbro "promised" us through their most recent Q&A session with Jedi Temple Archives that there should be a good amount of newness in the next wave of 3-pack Special Action Figure sets. New evidence has just shown up and clearly shows what will be included. We do see some "new" stuff thankfully! Click through to check it all out! We love the principle of the Jedi Vs. Darth Sidious Battle Packs set, but Research Droids Reviews would love to see a modern version with new updated figures and an all-new Chancellor Palpatine in maroon duds. Will we ever get it? Doubtful now, but maybe we can cobble together our own if Hasbro can at least finish up updating the rest of the characters in this set. Please leave comments in our new Disqus comments section about this item! Click the banner below for the direct link to the review! Don't forget we accept requests so e-mail us. Newest Saga Legends Showing Up! Some Have New Accesories! Our friends at GalacticHunter.com are reporting that the newest wave of Saga Legends are starting to show up. But what's even more interesting than that is the Spacetrooper is being shipped with a brand new gun. Click through to see what Adam Pawlus has to say about this! It's a big week over at Brian's Toys! They just received the new Gentle Giant 12" Vintage Jumbo Darth Vader & Leia Organa, as well as the Hammerhead mini bust! Looking for something a bit more manageable? Pick up the new 2011 Clone Wars Deluxe vehicles with figures! New and unique this week is the Darth Vader State by Encore, made in 2005 and limited to 250! Also check out the eFX Luke's Red Five X-wing Model, now back in stock! Check Out Yakface.com For Latest TVC Wave 7 Updates! We're about to throw in the towel trying to find wave 7 of The Vintage Collection. But thankfully our good friends at Yakface.com are briskly adding them to their own Toyguide! Check at Yakface.com for all you want to know about this very hard to find latest wave of The Vintage Collection. Hopefully we'll find us a set to add to our Research Droids Reviews soon enough. What a frustrating time to be a collector! McQuarrie Snowtrooper Mini Bust Announced As Next SDCC Exclusive! Gentle Giant, Ltd. announces their next 2011 SDCC exclusive: Ralph McQuarrie Snowtrooper mini bust! Click through for more information! If you like the color purple, you'll love the focus of today's Research Droids Reviews which goes into pretty good detail of a great TARGET exclusive Battle Packs set (back in the day when Battle Packs made you happy and not angry)! Please leave comments in our new Disqus comments section about this item! Click the banner below for the direct link to the review! Don't forget we accept requests so e-mail us. 2011 SDCC Exclusive Jumbo Vintage Kenner Jawa (Vinyl Cape)! Gentle Giant, Ltd. announces one of their 2011 San Diego Comic Con exclusives: the Jumbo Vintage Kenner Jawa (Vinyl Cape). Right now only Premier Guild Members can pre-order it. It's limited to only 1000 pieces! Click HERE to find out how to become a PGM beneficiary! At the end of 2006, Hasbro surprised collectors with the announcement of an updated Imperial Shuttle getting released as a TARGET exclusive. It was a steal in 2006 for $59.99, but today it commands a hefty premium. Should you get this or wait for a "BMF" version of it? Read Research Droids Reviews today and see if we can help you make your decision! Please leave comments in our new Disqus comments section about this item! Click the banner below for the direct link to the review! Don't forget we accept requests so e-mail us. Like Jedi Temple Archives On Facebook! In case you didn't know this yet, Jedi Temple Archives has our own page on Facebook. We are still far from our goal as to the number of "likes" we want have for our site! Be sure to like us as one of your favorite Star Wars fan sites so we can reach our goal! Check us out here or click the "Like" button at the top of our news page. And be sure to read about all of our exciting updates there! Here is a quick update from http://www.bigbadtoystore.com about a ton of great new preorders and more new arrivals! Hasbro updated the old Sneak Preview General Grievous and made him a basic figure for The Saga Collection. See the pros and cons of the figure in today's Research Droids Reviews entry, Please leave comments in our new Disqus comments section about this item! Click the banner below for the direct link to the review! Don't forget we accept requests so e-mail us. Congratulations Star Wars Action News! - Episode 300!!! This week Star Wars Action News releases its 300th regular episode (not even counting all the breaking news episodes, Book Club episodes, and episodes of Republic Forces Radio Network)! And it's got some good news, it seems from coast to coast, and even abroad, reports are coming in of new Wave 6 and 7 Vintage Collection figures being found! Listen as Marjorie and Arnie run down where these figures are being spotted, play listener store reports, and even address distribution again with Hasbro in Hasbro's latest Q&A! Click through for more! Our friends at MouseDroid.com have passed on very important charity information for a close family member whose infant died from SIDS. Click through for more information! Why would Hasbro rerelease the terrible 2005 ROTS III 2 Anakin Skywalker again as a basic figure in the collector-focused The Saga Collection. We're not exactly sure but Research Droids Reviews finds that "pimping" up the figure didn't really help it out that much. Please leave comments in our new Disqus comments section about this item! Click the banner below for the direct link to the review! Don't forget we accept requests so e-mail us. Today we have one more update for our Sideshow Collectibles Visual Guide. The newly released Gartogg (Gamorrean Guard) has just recently made its way to our doorsteps. Click the guide below for all the details, and in case you missed our in-depth review last week, stop by and read all about him in our Research Droids Review! Season 3 Of The Clone Wars Coming To Blu-ray/DVD October 18th! StarWars.com announces the official date for the Season 3 release of The Clone Wars on DVD and Blu-ray! October 18th is the lucky day for all! Click through for more, including additional info like 30 extended/deleted scenes and trailers and lots more! A New 2011 Clone Trooper Hits eBay! A new 2011 Clone Trooper hits eBay! Click through for additional close-up pictures! Defend Kamino Clone Trooper Fives Hits eBay! The "Defend Kamino" version of Fives has also hit eBay! Click through for additional close-up pictures! Defend Kamino Clone Trooper Echo Hits eBay! The "Defend Kamino" version of Echo has hit eBay! Click through for additional close-up pictures! New Commander Blackout Special Ops Clone Trooper Hits eBay! A new Ops Trooper hits eBay! Click through for additional close-up pictures! In 2005, Hasbro seemed to get Obi-Wan Kenobi nearly perfect. And this can be proven easily since they keep on rereleasing the figure over and over again. Research Droids Reviews notices that each release gets slightly better than the last! Please leave comments in our new Disqus comments section about this item! Click the banner below for the direct link to the review! Don't forget we accept requests so e-mail us. Special thanks to JTA reader Chad for pointing out an absolutely ludricrous eBay auction for the variant Wedge Antilles figure from The Vintage Collection. We won't tell you the price here in this post, you'll have to click through to see, but we can tell you it's well into 3 figures! People! Relax, this figure will become more readily available! It has to and even if it doesn't, if we complain enough, Hasbro will hear us and reship it in carry forward assortments even if it's months down the road! Q&A With JTA: Our Twenty-Third Column! Q&A With JTA continues! Click through to access the Q&A database with our latest batch of questions! Hot Topics: C-3PO figural collector case, TVC Luke Skywalker (Death Star Escape) and the Naboo Royal Starship (again)! The Vintage Collection Y-wing Hits Toys R Us In Australia! Our friends at MouseDroid.com are reporting that the unannounced TVC Y-wing is showing up in Australian TRU stores! Click through for their full report! See Jedi Force Figure In Full Reveal At Sandtroopers.com! Our friends at Sandtroopers.com received a nice gallery of images for the new line many collectors are anticipating: the Jedi Force figures! Click through to check out these new and very cute figures! It's time for another translucent blue Star Wars action figure! Research Droids Reviews checks out one of the better ones, Ki-Adi-Mundi, because less articulation makes these types of figure more believable! Please leave comments in our new Disqus comments section about this item! Click the banner below for the direct link to the review! Don't forget we accept requests so e-mail us. Ewan McGregor Talks About Wedge Antilles And Blu-ray! Star Wars alumnus Ewan McGregor talks exclusively with Play.com about the impending Blu-ray Star Wars discs and even talks about seeing his uncle (Wedge Antilles) in the cinema at a young age. Click through for more! Neimoidians used to be a favorite species that Hasbro liked to make into action figures, but we haven't seen any in about half a decade. It's high time for a super-articulated version now in 2011, but check out the latest available version in Research Droids Reviews and see why we have a long way to go before having one that is definitive. Please leave comments in our new Disqus comments section about this item! Click the banner below for the direct link to the review! Don't forget we accept requests so e-mail us. Brian's Toys has 8 brand-spankin' new Gentle Giant pre-orders available, including C-3PO and R2-D2 12" Jumbo as well as an awesome Darth Vader statue! Not to be left out of the new product spotlight are the Sideshow 12" Han in Carbonite and 3.25" Saga Legends action figures. Sure to go quickly into someone's shopping cart is the Vinyl Cape Jawa AFA 85, one of the rarest and sought-after Star Wars collector items. For more great stuff from this weeks newsletter, go to http://www.brianstoys.com/nl! Realistic Styled The Clone Wars Coming To The Vintage Collection! ActionFigureInsider received awesome news from Hasbro that realistic versions of The Clone Wars characters will be done in realistic style and released in The Vintage Collection in 2012! What an momentous event! Click through for the Q&A response! We don't ask a lot from you, but please, please, please read today's Research Droids Reviews article today. We have just discovered the greatest C-3PO collectible on the market and you just have to check it out to see what we mean. It's amazing! Please leave comments in our new Disqus comments section about this item! Click the banner below for the direct link to the review! Don't forget we accept requests so e-mail us. Sideshow Collectibles' Premium Format Han Solo in Carbonite is up for pre-order! Click through to secure yours! TVC Wave 7 In Stock At HasbroToyShop.com! Special thanks to JTA reader The_Question who lets us know that wave 7 of The Vintage Collection (Logray, Captain Fordo, Han Bespin, etc.) is IN STOCK at HasbroToyShop.com! The Clone Wars Season 4 Extended Trailer! StarWars.com has just posted an extended Season 4 trailer of The Clone Wars! It seems that Filoni is doing his own take own take on the Mon Calamari battle! Click through for the details! It's time for another unbelievable Life Size Bust! See why Greedo ranks pretty high up there with Darth Maul in this scale in our Research Droids Reviews today. Oh, and be sure to check back tomorrow, because we are going to look at another amazing one! Click the banner below for the direct link to the review! Don't forget we accept requests so e-mail us. Here is a quick update from http://www.bigbadtoystore.com about a variety of new preorders and more great new arrivals. We've added 50 Overstock & Exclusive items to our sale menu - prices have been cut on items like our Seacon Exclusive, Predaking, GI Joe Resolute, Star Wars, Marvel and more! Most of these prices will revert back to normal full price on Friday... so take advantage of the discounts now! Sideshow Collectibles: See The Distilled Rumors And Announcements! You already know that Sideshow Collectibles leaked a ton of information about future products being released in the Premium Format and one-sixth scaled lines. But if you haven't read their "Ask Sideshow" segment yet, we have it all distilled for you including all of the important things you need to know. Click through to see what they revealed and hints about what else may be forthcoming! Han Solo In Carbonite Premium Format Update! Sideshow Collectibles updates their production blog and show off the incredibly beautiful light-up features to the Han Solo in Carbonite Premium Format Figure! Click through for more! Wait! Didn't we just get this figure? Yes and no. But if you need further clarification, be sure to read today's Research Droids Reviews and determine if you need Sideshow Collectibles' latest 12" offering. We hope that you'll also leave comments in our new and fun comments section as well as placing your opinion of this item by voting in our poll. Click the banner below for the direct link to the review! Don't forget we accept requests so e-mail us. Hasbro checks in with the latest answers to our questions. Sadly, they completely lost our first round questions and didn't bother to answer them when I resent them. So, enjoy this round of Q&A! See Two Of The New Deluxe Figures In Action! Awesome Diorama Images! JTA foreign correspondent and friend Bryan Mark German also sends us images of two of the Deluxe figures loose and displayed with a gorgeous back drop. Click through to see these impressive images! See The New Deluxe Line Early! About To Hit USA In Less Than 30 Days! JTA foreign correspondent and friend Bryan Mark German and JTA reader Earl Madriaga send us new production photographs of the new Deluxe figures that just arrived in the Philippines! These are what we'll see in stores in the USA once they hit in less than 30 days. Click through for an exciting gallery of images including some box artwork! The first release of Clone Commander Cody left a lot to be desired, but Research Droids Reviews tries its best to look for the positives in this figure, which are few and far between. Too bad this figure aged right out of the package. The good news is that an awesome version is now available in The Vintage Collection! We hope that you'll also leave comments in our new and fun comments section as well as placing your opinion of this item by voting in our poll. Click the banner below for the direct link to the review! Don't forget we accept requests so e-mail us. Yes! Watto As A Mini Bust Is Now A Reality! Gentle Giant, Ltd. sends out June 2011 solicitations of new product our way! Check out the fan favorite Watto in mini bust form!!! Click through for more! Gentle Giant, Ltd. sends out June 2011 solicitations of new product our way! Check out the awesome Savage Opress maquette!! Click through for more! Gentle Giant, Ltd. sends out June 2011 solicitations of new product our way! Check out the Jumbo Vintage Kenner R2-D2 figure! Click through for more! Jumbo Vintage Kenner C-3PO Figure! Gentle Giant, Ltd. sends out June 2011 solicitations of new product our way! Check out the Jumbo Vintage Kenner C-3PO figure! Click through for more! The Empire Strikes Back Darth Vader Statue! Gentle Giant, Ltd. sends out June 2011 solicitations of new product our way! Check out The Empire Strikes Back Darth Vader statue! Click through for more! A Ton Of New Sideshow Collectibles Information Seeps Out! A new 12" Episode V/VI Darth Vader, 12" Boba Fett, 12" General Grievous, more 12" Yodas and a plethora of other information has just been indirectly confirmed by Sideshow Collectibles themselves! What are you waiting for? Click through now! OK, this is a figure we really love, but Research Droids Reviews is hoping that Hasbro will retool it at some point in the future and give us the corrections it deserves including some color adjustments, interchangeable (or removable) helmet and portrait, and enhanced articulation (get rid of those swivel elbows darn it)! We hope that you'll also leave comments in our new and fun comments section as well as placing your opinion of this item by voting in our poll. Click the banner below for the direct link to the review! Don't forget we accept requests so e-mail us. Cold Weather Plo Koon Hits eBay! Cold Weather Plo Koon hits eBay already! Click through for more. Savage Opress hits eBay already! Click through for more. Do you love alien Jedi as much as we do? If this is so, be sure to click through to read today's edition of Research Droids Reviews because we check out the biggest alien Jedi ever produced, Foul Moudama. We hope that you'll also leave comments in our new and fun comments section as well as placing your opinion of this item by voting in our poll. Click the banner below for the direct link to the review! Don't forget we accept requests so e-mail us. Today we are wrapping up our Sideshow Collectibles marathon, bringing 4 solid weeks of updates to a close. Stay tuned though, because in the coming weeks we will finally be getting to The Vintage Collection, with a huge marathon starting soon! In the mean time you can check out our final guide updates by clicking each one below, bringing our Sideshow Visual Guide page completely up-to-date to the new Enhanced format! Make sure you stop by our Sideshow Visual Guide to check out all of the progress we made over these last 4 weeks! You can also stop by our Visual Guide News Channel to see our most recent updates, in case you missed any! This week at Brian's Toys features FRAMED Artists Proofs from the masterful Christian Waggoner. These framed proofs display great, come with a COA, and part of an extremely limited edition size. If you are just looking for a few ungraded loose Star Wars vintage figures, Brian's Toys has restocked over 300 figures! Plus, pick up the Gentle Giant 12" Han Solo (Small Head) Jumbo that is back in stock. Finally, check out the pre-orders for the new KRE-O line from Hasbro. These building block sets will remind you of your other favorite building block toy, but this time, it's an official Transformers line! It's a childhood dream finally coming true. For more great products, head on over to http://www.brianstoys.com/nl! The best Episode III Anakin Skywalker collectible is the subject of today's Research Droids Reviews entry. Familiarize yourself with the Premium Format Anakin Skywalker figure because it's a work of art! We hope that you'll also leave comments in our new and fun comments section as well as placing your opinion of this item by voting in our poll. Click the banner below for the direct link to the review! Don't forget we accept requests so e-mail us. Todays Premium Format Visual Guide update features the Scout Trooper. Click below to check out this detailed Sideshow Collectibles piece, and stop by our Research Droids Review for full details on this figure! See a good Battle Packs set in today's Research Droids Reviews that is a great value for your dollar! We hope that you'll also leave comments in our new and fun comments section as well as placing your opinion of this item by voting in our poll. Click the banner below for the direct link to the review! Don't forget we accept requests so e-mail us. We are switching gears for a few days of our Sideshow Visual Guide marathon and taking a look at a few Premium Format Figures. First up is Count Dooku. Click below to check out this slick PF figure, and make sure to check out even more details over in our Research Droids Review! Sideshow Collectibles Announces Han In Carbonite Premium Format Figure! Sideshow Collectibles announces their next Premium Format Figure: Han In Carbonite! Click here for the preview page, and place your pre-order at the launch of next weeks newsletter! The Sideshow Collectibles I Am Your Father diorama is now available for pre-order! Click here to place your order. It's frustrating when a greatly designed vehicles suffers from imperfections. This is true for the AT-AP, the third release from Hasbro (but second repaint). Research Droids Reviews determines it loooks great but lacks in some functionality. We hope that you'll also leave comments in our new and fun comments section as well as placing your opinion of this item by voting in our poll. Click the banner below for the direct link to the review! Don't forget we accept requests so e-mail us. Today's update brings all of our older existing guides from the Sideshow Collectibles 1/6 scale line up-to-date with our high resolution Enhanced Visual Guide Format. Click each guide below to check them out, and make sure to see our complete Sideshow Visual Guide to browse what else Sideshow has made over the years! The latest The Old Republic cinematic is available to view! Check out this awesome clip! Click through to check out Return! Check out today's Research Droids Reviews to see a cool repainted vehicle! Oh, and it's Cad Bane's vehicle! You must see this! We hope that you'll also leave comments in our new and fun comments section as well as placing your opinion of this item by voting in our poll. Click the banner below for the direct link to the review! Don't forget we accept requests so e-mail us. Check Out TVC ARC Trooper Commander Up Close! Our pals at ImperialShipyards.net got an early eBay sample of the ARC Trooper Commander Captain Fordo figure and have put together a great little review with lots of pictures. Enjoy their analysis of the figure, but don't forget to keep checking back with us because once we find this wave at retail, they'll be going directly into our Research Droids Reviews! Todays update features some updates to our older guides. We've converted these guides to our new Enhanced Visual Guide format. Click each one below to check them out, and stop by our Sideshow Visual Guide page for our full Sideshow Visual Guide coverage! You want complete details on the "unofficial" TRU exclusive Y-wing Fighter? Sandtroopers.com have ALL the details you need! Click through for more! Shortly after The Original Trilogy Collection but way before The Vintage Collection, collectors were treated to a replica of a Star Wars collectible that was responsible for starting it all for the toy line long ago. And Research Droids Reviews goes into detail about what makes the set notalgically relevant despite the included figures not being so definitive. See what you think! We hope that you'll also leave comments in our new and fun comments section as well as placing your opinion of this item by voting in our poll. Click the banner below for the direct link to the review! Don't forget we accept requests so e-mail us. Galactic Heroes AT-ST Found On East Coast! As first reported by our friends at Yakface.com, we can confirm that the Galactic Heroes Hoth AT-ST Assault (with exclusive AT-ST Driver) has been found at Toys R Us stores on the East Coast. Our particular sample was located in Langhorne, PA.
We enter our fourth and final week of our Sideshow Collectibles Visual Guide marathon. Todays update features a two-pack from 2009: The San Diego Comic-Con exclusive Luke Skywalker and Han Solo (Stormtrooper Disguise). Click below to check out this great two-pack, and don't forget to read all about them in our Research Droids Review! Also, if you have missed any of our updates you can see the last 20 most recent updates on our Visual Guide category page right here! Where For Art Thou Wave 8 And Wave 9? There is a lot of buzz about "wave 8" of The Vintage Collection getting delayed until October this year and as a result leaving us with a very dry summer. But what we don't understand is that people seem to be forgetting that there are two other waves that are due to hit before this said "wave 8" including the Aayla Secura wave (the "true" wave 8) and the Ponda Baba wave (wave 9) (due to hit per Hasbro's Toy Fair slide presentation July/August/September - this info could have certainly changed). Maybe these figures have been pushed to the Fall? Our friends from Yakface.com have this exact question proposed to Hasbro in order to clarify things, but until we hear more, we should probably count on those two other waves hitting through the summer. Ugh! This stuff is so frustrating! Q&A With JTA: Our Twenty-Second Column! Hot Topics: Wedge Antilles, Ewoks and The Vintage Original Trilogy Collection Luke Skywalker figure! In case you couldn't tell, Research Droids Reviews loves the Life Size Busts line from Sideshow Collectibles! Look at what an accomplishment the General Grievous Life Size Bust is! Have you ever seen anything cooler? We hope that you'll also leave comments in our new and fun comments section as well as placing your opinion of this item by voting in our poll. Click the banner below for the direct link to the review! Don't forget we accept requests so e-mail us. It Is Still Shipping! And It Is Arriving In Places Unexpected! It's six months after the fact and they're expensive, but guess what I found at....wait for it....Kmart!? Sideshow opened a new line called Expansion Packs in 2006. Kicking off that line was the Sith Probe Droids to go along with the newly released Darth Maul. Check out this trio of droids in the Visual Guide below. Make sure to stop by our Sideshow Visual Guide page to check out the entire line of Sideshow 1/6 scale figures in an easy to read format, including a hover preview that shows you a sample of the guides before you click on them! Research Droids Reviews looks at another great army-building Battle Packs set that was released as a TARGET exclusive. This time, collectors get a healthy dose of the 212th Attack Battalion. We hope that you'll also leave comments in our new and fun comments section as well as placing your opinion of this item by voting in our poll. Click the banner below for the direct link to the review! Don't forget we accept requests so e-mail us. JTA forum member Sugarfly has sent in some information about the status of Saga Legends at Walmart. It seems that no two Walmart stores are handling this assortment consistently, but in LA (Louisiana) multiple Walmarts are still blowing them out for $3.00 a piece. In Philly and some stores we visited in NJ, Saga Legends are full price. Who knows what's really going on anyhow!? Click through for the proof. We finalize our Militaries of Star Wars updates with a unique offering from Sideshow. The exclusive version of this figure wasn't just a small accessory, but a full environment piece with a hefty price tag attached to it compared with the non-exclusive release. Click below to check out Grand Admiral Thrawn and his full scale Command Chair. You can also read all of the details on this Sidshow offering in our in-depth Research Droids Review! Another What The Heck Moment - What Is Going On Any More? OK, this one is for the record books. We encountered an unfortunate case of "vandalism" at our local Walmart this morning. Almost every single The Clone Wars figure in stock was torn open (and we imagine subsequently taped back together by a Walmart employee). We checked a few over and couldn't see anything missing from the packaging, but why would someone do this? Is it a disgruntled collector who can't afford the figures any longer? Or is it a Walmart employee trying to tick off collectors? Or maybe it's just a kid with parents who don't love him. We don't know. It's a shame because most of the Barriss Offee wave was there. It never ceases to amaze us that we will be treated to a new retail experience when it comes to Star Wars collecting. We guess we haven't seen it all. It's bad enough the stuff is impossible to find and then when we do find it, it's vandalized? Click through for a large picture. Research Droids Reviews looks at one of the best army-building Battle Packs sets of all time. Forget about ever seeing something as wonderful like this ever again, but spend some time to see what we were "treated" to only 3 short years ago. (Sigh!) We hope that you'll also leave comments in our new and fun comments section as well as placing your opinion of this item by voting in our poll. Click the banner below for the direct link to the review! Don't forget we accept requests so e-mail us. TVC Wave 7 First Retail Appearance Reported! Our friends at Rebelscum.com are reporting the first USA appearance of wave 7 of The Vintage Collection at brick and mortar retail. This wonderful wave has been found at....GASP!....Toys R Us! You may want to put TRU back on your morning errand runs again! Kotobukiya ArtFX statues have come in stock at Brian's Toys! Pick up these affordable and awesome displays featuring Boba Fett and a Stormtrooper build pack! Check out the exclusive ACME Archives artwork (Set of 12) from 2010 that honors the 30th anniversary of the Empire Strikes Back! Each piece is signed and limited to only 100 pieces. For more great stuff, check out the newsletter over at www.brianstoys.com! We follow-up yesterdays Sandtrooper Squad Leader with the Sandtrooper Corporal. Click below to check out this Sideshow Store Exclusive. After you are finished checking out our Visual Guide, stop by our Research Droids Review for even more details about this Sandtrooper release! Sideshow Collectibles 2011 SDCC Non-Attendee Edition Clone Commander is now available to pre-order! If you are NOT attending SDCC this year make sure to get your order in to secure the Clone Commander! It's time! Check out today's Research Droids Reviews entry because it's all about the neatest 12 Inch Figure Environment yet from Sideshow Collectibles. If you want to see amazing craftsmanship and a plethora of accessorie (oh, and cool electronics) then click through because this is a piece NOT to miss! We hope that you'll also leave comments in our new and fun comments section as well as placing your opinion of this item by voting in our poll. Click the banner below for the direct link to the review! Don't forget we accept requests so e-mail us. Holographic Clone Commander Cody Is In Scale To Movie! JTA reader Richard Wardlaw points out a needed correction to a mistake that was posted in our RDR on the Holographic Clone Commander Cody action figure in The Saga Collection. We made the mistake of stating that Cody did not appear in full scale holographic form which is not true. During the scene in the Jedi War Room, multiple holographic images of Jedi in addition to Clone Commander Cody are in full scale size rendering the action figure correct. The review has been updated and a new photo has been added as well. Thank you Richard! See The Jumbo Vintage Kenner Darth Vader - Now Arriving! JTA reader Tray sends in some quick pics to share with the rest of the class of the just-released Jumbo Vintage Kenner Darth Vader! Click through to check out some packaged shots and a comparison shot as well! Sideshow Collectibles Announces Their Next Diorama: I Am Your Father! Sideshow Collectibles has announced their next diorama from their Versus line. 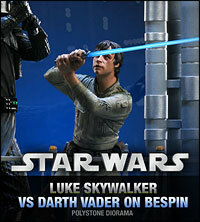 Click here to preview the Luke Skywalker vs. Darth Vader I Am Your Father polystone diorama! Our Sideshow Marathon continues today with the addition of the incredibly detailed Sandtrooper Squad Leader. Click below to check him out! This iconic character is captured in great deatil, but find out why he didn't quite get 5 stars in our Research Droids Review! Here is a quick update from http://www.bigbadtoystore.com about a variety of new arrivals and some awesome new preorders! Wave 7 Shipping Notices Getting Emailed To Those That Pre-Ordered! JTA Facebook fan Jose Raul Gonzalez posted on our wall that BBTS has sent out shipping notices that wave 7 has gone out to those who pre-ordered them, despite them currently showing a status of pre-order now. It might be worth your while to head to BBTS and place your order! Sideshow Collectibles 2011 SDCC Attendee Edition Clone Commander is now available to pre-order! If you are heading to Comic-Con this year, pre-order yours today for pickup at the show! It's Official! Star Wars Celebration is Back in Orlando! TVC Captain Fordo Hits eBay! We came across a UK eBay auction which showcases The Vintage Collection's Captain Fordo! This auction is ridiculously expensive, but click through to check out the nice close-up shot of this ultimately awesome Tartakovsky creation! Best....mini bust...ever! We are very picky about the products that Gentle Giant, Ltd. makes but Research Droids Reviews quickly determines that the Shaak Ti mini bust is one of the easiest on the eyes! Be sure to check out this wonderful bust! We hope that you'll also leave comments in our new and fun comments section as well as placing your opinion of this item by voting in our poll. Click the banner below for the direct link to the review! Don't forget we accept requests so e-mail us. Yoda's Hut (Dagobah) Sneak Peek On Our Facebook Page! We just posted a sneak peek of the just released Yoda's Hut (Dagobah) 12 Inch Figure Environment on our Facebook page. You must check it out. There's no other way to put it. Full Research Droids Reviews overview coming Friday! Sideshow adds another Expanded Universe character to their line-up. This time it's the popular Blackhole Stormtrooper. Click below to check their version of this unique Stormtrooper, and see why we gave it five stars by stopping by our Research Droids Review! Our friends at Yakface.com are reporting on a variation of the impossible to find Wedge Antilles figure already! Click through for more! San Diego Comic Con Exclusive Clone Commander Details Revealed! Sideshow Collectibles updates their production blog with new photos of the 12" SDCC exclusive Clone Commander! Check it all out!